If you're anything like me, you're far from perfect when it comes to money! The examples set by the adults in my life as I grew up weren't exactly useful, but learning how to stand inside my personal power and take ownership of my life has enabled me to identify and combat those limiting beliefs. For a long time I didn't think the money issue was a good thing to explore using Tarot. I just figured the two things didn't really gel well together and it was never a subject which particularly inspired me. As someone who's never had any training in business and wealth creation, debt control or financial advice, I didn't feel that I had any right to help people with their money issues using spiritual counselling techniques, but I actually couldn't have been more wrong. As I've grown up I've realised that most of the problems we have with money stem from emotional issues and their deep-seated root causes can be addressed and dealt with in order to make money work for you. That's why I finally saw the light and added the Finance Focus Tarot Reading to my shop. If you have an unhealthy relationship with money, you might want to read on for five key emotional money problems which really spoil the fun..
1. Do you pile purchases onto your pain? Have you ever had a crappy day and then made yourself feel better with a new purchase? Do you feel called to the shopping centre when you're low on self-esteem? Maybe you feel like you're only able to clear your mind once you've cleared your bank balance. This is no way to live life. Seeing money as a mood changer gives it way too much power over you. Telling yourself that you'll feel better after you've picked up that expensive dress you've been dying to get your hands on means that you're actually glossing over the issue. You're providing yourself with a temporary fix rather than facing the problem head on and finding a solution that really puts it to bed once and for all. The next time you feel like heading for the nearest retail outlet, examine your reasons and be honest with yourself about the deeper issues. This is an act of self-love. Although it doesn't seem like it, giving yourself a luxury purchase when you feel terrible is actually harmful, not helpful. You deserve to create the life you desire, not turn your back on it while you shop for goodies and then pretend those problem areas don't really exist until the next time they come to haunt you. 2. Would you rather cover your eyes with money than spend it wisely? If you have difficulty checking your mail for fear of red letters or bank statements, you're certainly not alone! But turning a blind eye to debt or procrastinating on that cutting back you've been talking about is only prolonging the agony. You do not deserve to suffer from anxiety and sadness over money. No one does. But only you can take the necessary accountability needed to stop this from happening. If you think you may be having issues with facing up to your money troubles, confide in a trusted friend or open up to your partner, call a free debt advice agency for a confidential chat or bring it up with your therapist. It's ok to need help. You're just going to have to be brave enough to ask someone for it! But, once you've done that, you'll feel less alone. Take a deep breath and start talking about your fears. It's difficult to deny them once they're out in the open and the ones you love will want to help you hug your money monster. 3. Do you tell yourself you inherited bad habits instead of liquid assets? I encourage you to really explore the root causes of your issues with money. Many of our key influences when it comes to finance were absorbed in childhood. The way we see the world is greatly shaped by whatever we sucked up when our brains were super powerful sponges. But working out the root causes for your money issues is only half the work. The other half starts when you free yourself from the reasons why, stop holding onto the past and tell yourself that you deserve a better connection to your cash. It's easy to fall prey to victimhood but it's essentially a waste of precious energy. Find the root causes so that you can forgive and release, making way for the kind of money mind you want to have. Try journalling and brainstorming to figure out what your root causes are and how to make your peace with them. 4. 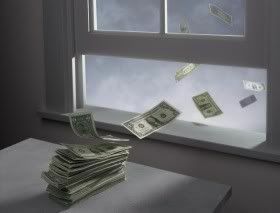 Do you experience money mood swings? Maybe you're not clear about what money means to you, what you want from it and where it factors into your life. Spiritually centred people often have this problem because we're so often reading about how money doesn't mean anything and that it's love, not cash, that makes the world go round. Whilst the anti-materialism camp have a lot of things right on this, they sometimes forget to make room for the fact that money is a part of life. We need to establish our ground rules, our principles and our signature strengths when it comes to what we earn, what we spend and what we feel about it. If you're in conflict because you're money-minded but you also happen to think that money is the root of all evil, it's time to start figuring out what your core money principles are and work on being ok with the role money plays in your life. Don't be an apologist and don't be ashamed of wanting financial security. 5. Do you focus too much on someone else's cookie jar? No one's perfect. Sometimes, when you see someone else having it easy, getting everything they want and never going through financial hardship, you'll feel pangs of jealousy. Unless you've reached Nirvana, it won't have escaped you that some people have more than others and it also may have crossed your mind that some people will never have to deal with the kind of compromise and difficulty that you're encountering. It's easy to start placing an intense amount of focus on what other people have and what they've done or not done to earn it. But let's face it, you may as well be throwing that energy out of a moving car - it's wasted on such concerns. Forget everyone else and focus on how to make money work for you. Feel gratitude every day for what you do have and count every blessing, even when you're finding it difficult to get into that kind of mental space. I know I don't have to remind you that material wealth does not necessarily equal happiness. When you find yourself experiencing envy, consider the difficulties that those well-heeled people may be experiencing in other parts of their lives. They're no different to you. They have their battles to fight, just not with their bank manager! Much love and prosperity to you all.